Do you want to have more neighbors but not more Facebook Friends? Join the Royal Council NOW and you will be able to get more neighbors exclusively for the game: you won't need to be a Facebook friend. This new neighbor (not a Facebook friend) is called Royal Councilor. 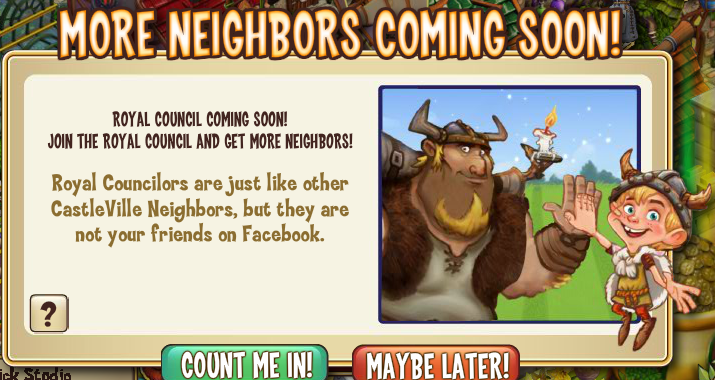 After added a Royal Councilor, you will be able to visit and share requests, as a usual neighbor. The Royal Councilor will only be able to see limit information: your name, profile photo, how often do you play Castleville, and maybe your social network ID number. Royal Councilors will not have access to your Facebook profile, since it is not a Facebook Friend. If you don't click for the Royal Council system, you won't be recommended as a Royal councilor (NEW NON-FACEBOOK NEIGHBOR) to other players that are in this system. If you click to get in this system, you can at any time unchecking the below box, but to be effectively out it can take up to 72 hours.